Balabolka Portable is a Text-To-Speech (TTS) program. All computer voices installed on your system are available to Balabolka. The on-screen text can be saved as a WAV, MP3, MP4, OGG or WMA file. 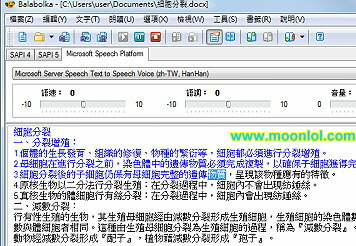 The program can read the clipboard content, view the text from AZW, AZW3, CHM, DjVu, DOC, EPUB, FB2, HTML, LIT, MOBI, ODT, PRC, PDF and RTF files, customize font and background colour, control reading from the system tray or by the global hotkeys.